Game of Thrones Fans: I thought you all could use something to go with that whine after last week’s episode. These wine charms showcase six house sigils from Game of Thrones including Stark, Tyrell, Targaryen, Baratheon, Greyjoy, and Lannister. Pick your alliances wisely and trust your friends to obey basic hospitality rules while in your home! The set is perfect for your next viewing party and makes a great hostess, housewarming, or wedding gift. 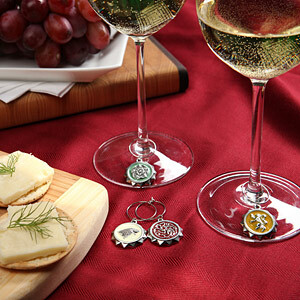 The wine charms are available for $24.99 for a set of 6 at ThinkGeek.com. Tara is at Science EXPO Day!